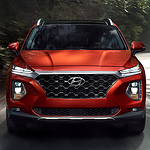 The Santa Fe is Hyundai's bestselling SUV in the US. People love this crossover for its sleek design and comfortable ride. It also packs a surprising amount of power. Depending on specifications, the Santa Fe gets between 185 and 235 HP. The engine also cranks out 178 to 260 lb-ft of torque. That's not all the Santa Fe does. The 8-speed transmission offers a manual shift mode. That helps drivers really feel like they're in control, and in touch with the road. Finally, features like lane keeping assist are standard. In the Hyundai Santa Fe, the car itself helps you to avoid obstacles and collisions. To really understand how powerful the Hyundai Santa Fe is, you'll need to take one for a spin. Drop by Korum Hyundai any time. Our qualified, professional team would love to put you behind the wheel. Excellent performance is the reason this car is so popular.